For those of us who grew up in the 80s and 90s, at the peak of the AI DS epidemic, we can sometimes forget that, while not as deadly as it used to be, HIV infections still continue and can have devastating impacts on people’s lives, especially those already disadvantaged by socioeconomic factors and healthcare disparities. 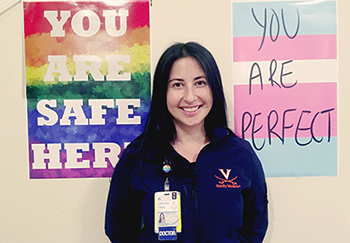 The Ryan White HIV Program at UVA Health, here in Charlottesville, serves people throughout central Virginia needing care. 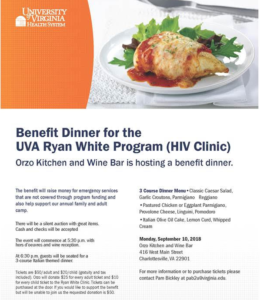 You can celebrate Pride Week and support this important clinic by attending the benefit dinner at Orzo on Sept. 10. Proceeds help provide emergency services not covered through the Ryan White program’s funding and an annual camp for families affected by HIV. Tickets are $50 for adults and $20 for children. Learn more.